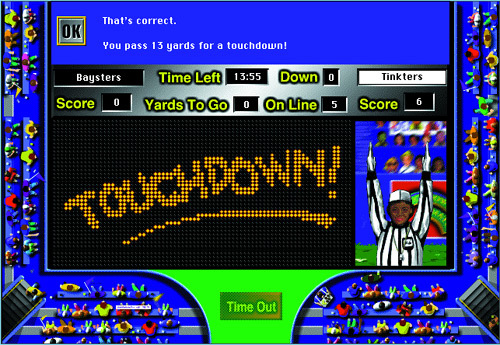 The Touchdown Math Series is an ideal way to reinforce key math computational skills in a highly motivating environment. Students quarterback their teams to victory by working through a wide range of problem types preselected by teachers or selected by students. Correct answers gain yardage and first downs. Wrong answers allow the defense to take over. CD-ROM based program for Windows or MAC Operating System, network version available. Touchdown Math is split into 5 exciting interactive games. Multiplying and dividing decimals with zeros and various multipliers, divisors, etc. • Each title offers a wide range of carefully selected skills. • Time out feature provides struggling students with helpful step-by-step tutorials (CD-ROM only). • Perfect blend of time-on-task learning with football excitement. • Works well in the classroom, computer lab and media center. • Use to supplement textbooks and other core math instruction. • Utilize self-enroll with automatic monitoring of students’ progress. • Customize programs for individual needs by selecting skills, setting difficulty levels, and tailoring program features. 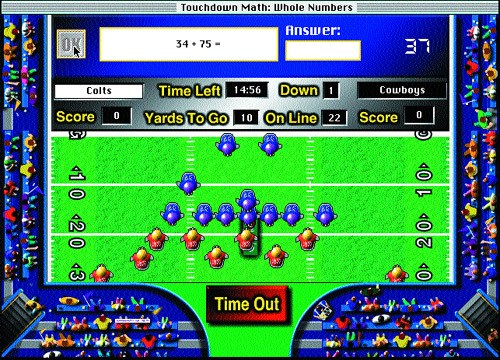 The Touchdown Math Demo is availble in either a Windows or MAC format. The demo is an example of the Touchdown Math Whole Number program in the Touchdown Math bundle.